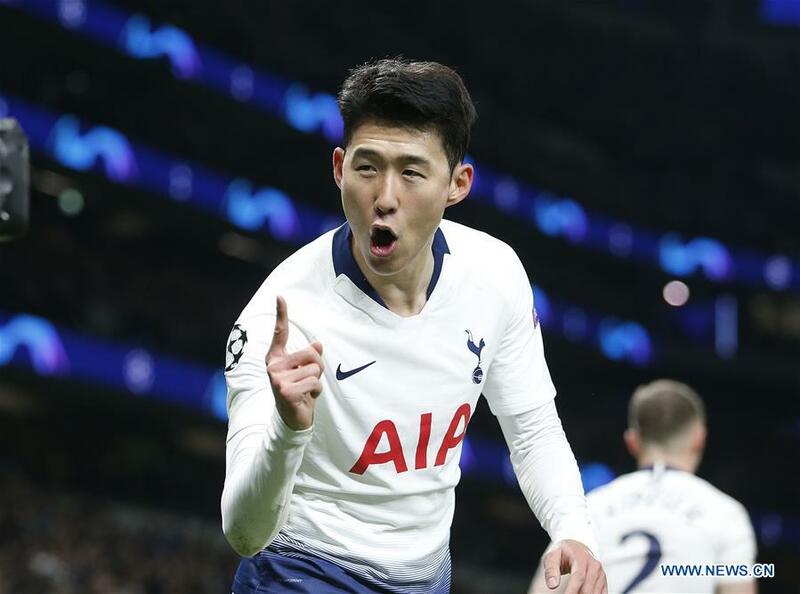 Son Heung-min hailed Tottenham Hotspur's fighting spirit as it shrugged off Harry Kane's injury blow to beat Manchester City 1-0 in the first leg of their all-English Champions League quarterfinal on Tuesday. Son was Spurs' hero as he netted a cool winner late in the second half to give his side a slender advantage to protect in next week's second leg in Manchester. "It was a very difficult game but in the end we were more clinical than them." Son had scored the first goal in Tottenham's new ground in its Premier League win over Crystal Palace last week. Six days later, he was once again the toast of the 62,062 spectators. "I like this stadium, it is amazing to play here, I am grateful for the opportunity to play here," Son said. While Tottenham has control of the tie, Son warned it will need another herculean effort to knock out City at Etihad Stadium on April 17. Much-maligned Tottenham keeper Lloris also enjoyed a sweet moment of redemption in a troubled campaign when he saved Aguero's first-half spot-kick. Pochettino was delighted with Tottenham's display against the Premier League champion, but insisted the tie was still delicately poised. "There are still 90 minutes to play and it's Manchester City. But with the spirit we show, anything is possible." "It is very disappointing. We are going to miss him-maybe for the rest of the season," Pochettino said. "It is a worry for us. We hope it is not a big issue, but there is not too much time to recover. He twisted his ankle." Having won the League Cup, reached the FA Cup final and kept the destiny of the Premier League title in its own hands, this was City's next hurdle in the race for an unprecedented quadruple. It appeared the strain of competing on four fronts might be taking its toll on City as it followed a lethargic FA Cup semifinal win over Brighton with this decidedly tepid effort. But City manager Pep Guardiola said his players had done enough to deserve a draw and are more than capable of rebounding in the second leg. "We created chances, more than the penalty. Except for a few set pieces and some counterattacks, we controlled the game," Guardiola said. "When we are not good I say so, but I don't have that feeling. The result is not the best one, but we have to make these kind of comebacks to go through. City's first loss since a Jan 29 setback at Newcastle is not fatal to its European ambitions, but it will have to improve on this tired effort to stop Tottenham reaching its first European semifinal since 1984 (when it won the UEFA Cup). "Nobody said it would be easy. We have to show what we can do in the next game," Guardiola said. "We have our a big job to do."